At Basel 2006, TimeZone (TZ) had the privilege to visit Patek Philippe and interview Mr. Thierry Stern, Vice President and Mr. Claude Peny, CEO. Later, we were joined by Mr. Philippe Stern, Chairman. The interview lasted about an hour and was conducted in French. No questions were provided in advance. The interview was conducted on March 30, 2006. (TZ): Thank you so much for the opportunity to have this interview. I would like to start with retail. When will the Geneva boutique open and what will it look like? Thierry Stern: We hope to be open by the end of this year. The entire building has been renovated. Three floors will be open to the public. We plan to organize some exhibits around particular themes. We will also have the entire current collection permanently available for our customers at the Boutique; this is important to us. We wanted to create three Patek Philippe destinations within Geneva, a Patek triangle if you wish, between the factory in Plans-les-Ouates, the Patek Museum, and the Boutique. TZ: Do you mean that all the watches currently available in the catalogue will be for sale at all times at the Geneva Boutique? Claude Peny: No, that would not be fair to our retailers. Some difficult to obtain models will not be available for sale. Customers will be able to view the watch, but will have to order and wait for it. TZ: There have been rumors that you recently purchased the Patek Philippe Boutique on Bond Street in London (that boutique belonged to a retailer), is that true? 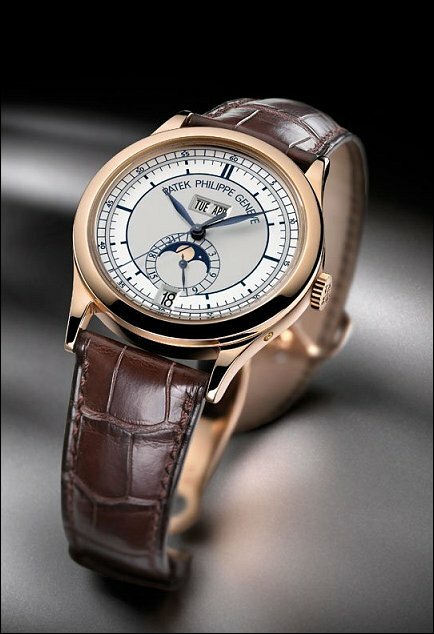 Is Patek developing a strategy of vertical integration from manufacture to retailer? Thierry Stern: Yes we bought the Boutique in London, It was an opportunity we could not miss, because that location is important to us. No, we are not interested in opening Boutiques everywhere. We have a very close relationship with our clients and partners, the retailers. These relationships are important to us. 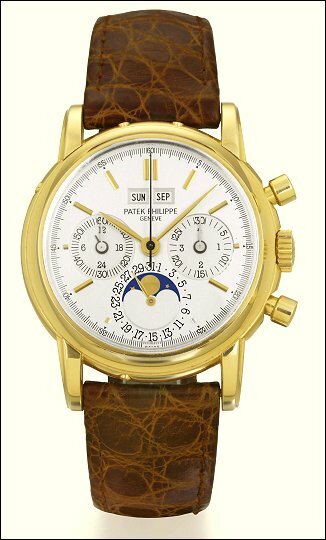 TZ: Speaking of relationships, there have been a few rumors about the 27-70, among them that Patek will terminate production of the 27-70 because Swatch will soon force you to have the Lemania name on the movement. Claude Peny: We are already stating in our literature that the movement is a base Lemania. I was recently meeting some of their executives and there was no such issue. We already do most of the work in house on the Lemania, including a number of manufacturing and decoration operations that are no longer being made by Lemania. TZ: I want to mention a model that is important to the TimeZone reader, and that is the 3970. I understand that you will not give production numbers, however recently Antiquorum has written about the production at length in conjunction with recent auctions, providing breakdowns between the 3970 and the 3970E, including hand shapes and most importantly the overall production by case colors (Platinum is the rarest, followed by white gold and rose gold and finally yellow gold). Did you provide these numbers? Claude Peny: No we did not, but I think they know where to get the information. Thierry Stern: You know William, all these breakdowns are unbelievable, these classifications… Within Patek, we have four references for the 3970 and that’s it. 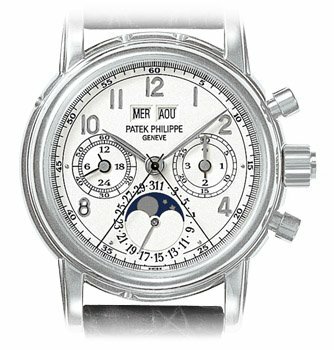 Those tiny variations are not so important at least not in Patek Philippe’s eyes. TZ: The price of the 3970 is climbing fast, and some people even speak of speculation. What is your opinion? Thierry Stern: No it is not discontinued. We only have three master watchmakers working on the 5004. They also handle repairs, so obviously production is very low. But expect to see them soon. Claude Peny: We stopped production in 2003 to make some changes to the movements… some improvements that do improve the functioning of ref. 5004. We propose to retrofit these improvements to the older movements as they come in for service. Thierry Stern: We offer this possibility to the client. Some choose to do it, others don’t (wry smile), preferring to keep the movement as original as possible. TZ: What about the 5070, are we at the end of the run for that model? And is the 5970 soon to be discontinued with the release of the 5960? Thierry Stern: No, we are not planning to discontinue either watch. We have not set specific production time periods. We try to look at the big picture, but also satisfy our collectors. There are no plans to discontinue these models. TZ: This brings me to the 3712. One year of production, and the rumor is that the watch is already discontinued? Thierry Stern: Yes, the 3712 is discontinued. It is rather the way we produce that reference that made us stop production. It was different than the way we will produce the new Nautilus collection. TZ: I was surprised not to see the new Nautilus line. When will it be released? And why does the 3712 not fit within that line? Thierry Stern: We are a small company with limited capacities. Producing the unique components required for the 3712 bracelet separately from the rest of the Nautilus line did not make much economic sense. The new Nautilus will be available in the Fall. TZ: About the 5960, it is a rather interesting concept: you integrated a small complication (annual calendar) with a more classic one (the chronograph). Furthermore, your have a very original design. Can you tell us more? Thierry Stern: We are very proud of the 5960. The first in house chronograph was important to our collectors, and to us. We wanted to create something original, interesting and forward. We have received excellent feedback about this watch. TZ: With a price that is relatively affordable, will production be able to satisfy demand? Claude Peny: Yes. Regarding the price, a few people have commented on that. Thierry Stern: We used to deliver the first shipment of new watches in small batches of 80 to 100 pieces, however we were not satisfying demand. In certain markets, some retailers received new models, while others who did not complained to us. With this watch, we want to satisfy everyone, at least in a specific market, so we will not ship the first watches until we have reached 300 units in production. Until then, we will not ship the watch to our retailers. TZ: The new Men’s 2006 collection has a common theme: size. You are replacing a few older models with larger watches. Do you think that trend is here to stay? Thierry Stern: Yes absolutely. Today’s teenagers are taller and bigger than one generation ago. Large watches are here to stay because they are more legible and proportionate to our wrist. For example, the new Worldtimer has better legibility. The cities were a bit “tight” on the inner bezel of the 5110. This one is easier on the eyes. TZ: The 5396 is another new watch that will become a big star. The windows for the day of the week and the month seem very appealing to collectors. But did we need another annual calendar? Thierry Stern: Collectors requested this watch, and we have already received great feedback. The annual calendar is very popular, and this combination is what the market was expecting from us (note that the very popular 5125 Wempe limited edition had the same dial set up). TZ: Last year you released the silicium anchor in a limited edition reference 5250. What feedback have you received from the happy few owners? Thierry Stern: Very little (smile). It seems most collectors have kept the watches in their safes. However, we have done extensive testing and control in house. It works very well; it is reliable. TZ: You are introducing the Spiromax in a new 2006 “Advance Research” limited edition this year, and the edition is very small. Why such a small number? Thierry Stern: We can’t make everyone happy. We are limited by our production capacities. Philippe Stern (who just entered the room): I want to know who buys this reference as we do for our minute repeaters. We work very closely with our retailers to know the final customer who will buy our minute repeaters. 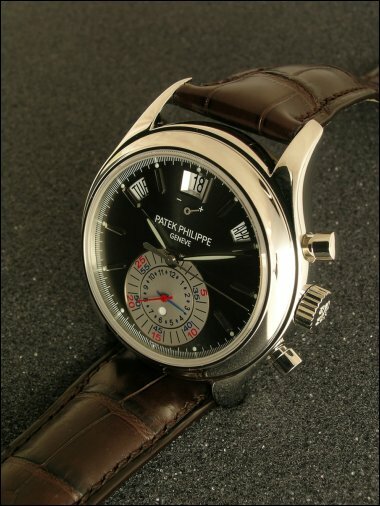 We want to know which Patek Philippe watches they already own. I do not want to see minute repeaters in the grey market, and it is the same with these limited editions. TZ: You will have 300 watches this year; that is quite a few customers to know. Philippe Stern: We will try. TZ: My favorite watch this year is a ladies watch, the Gondolo Serata ref 4972/4973. It reminds me of the vintage reference 2442. Thierry Stern: The watch is thick and it’s a beautiful design, in great contrast to the new Gent’s model Gondolo Trapèze. The latter could also be worn by a woman. It is thin and not very large. Do not forget the new ladies Calatrava 4896. Very thin and elegant; a favorite of mine. 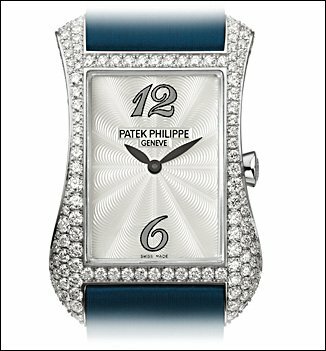 Philippe Stern: You will always find vintage Patek DNA in our watches. 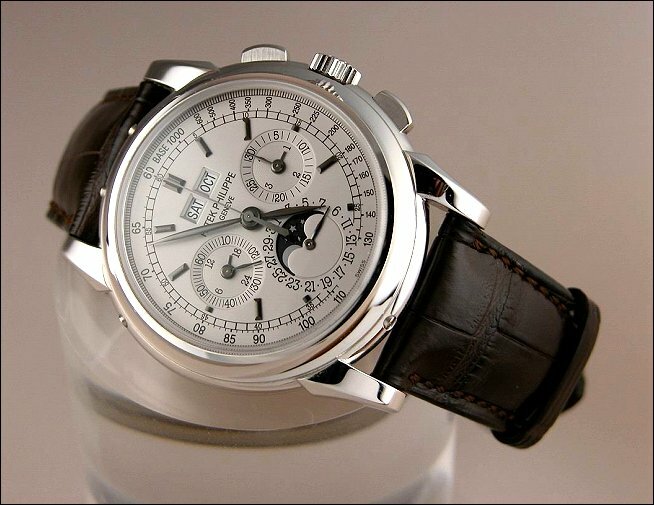 TZ: It seems important to Patek that the customer knows and understands Patek history. However the last 15 years are not well covered in Patek books. Will you soon release a new edition of Huber & Banbery, or a new book? Philippe Stern: Books are tremendous work. We have no plans for a new book on the history of Patek, however we are working on a book for the museum. It will be a catalogue raisonnée of the museum’s entire collection. TZ: On that note, I would like to thank you Gentlemen for sharing this time with us. 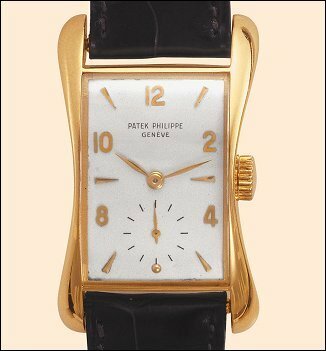 Mr. Philippe Stern wore a 5296 in white gold, as did Mr. Claude Peny. Thierry was wearing a 5056P.